It nourishes and heal the under eye skin. It contains Natural Under-Eye Gel & Petrochemical Free Lip Balm. It is free from all Petrochemical including LLP and Wax etc. 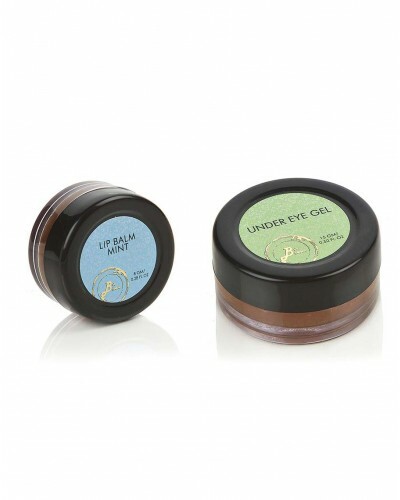 This Set of 2 contains Biobloom’s Natural Under-Eye Gel & Biobloom’s Petrochemical Free Lip Balm. Biobloom’s Paraben Free, Aloe Vera based Under-Eye Gel includes vitamin A, E & C, which nourish and heal the under eye skin. Cucumber Juice soothes and aids the delicate skin. Mint and Green tee extract diminish sagging skin & dark circles. Biobloom’s Chemical Free Under- Eye Gel is perfect to Treat Tired Eyes, Puffiness & Dark Circles. Biobloom’s Chemical Free Lip Balm is made of 100% natural beeswax. Biobloom’s Natural Lip Balm is free from all Petrochemical including LLP, Wax etc. It moisturizes the lips and protects them from external exposure, lips being the most vulnerable because of thin skin.